Long before Hydro-Quebec, in the early days of hydroelectric development in the province, surveyors were sent to assess the flow of the Manicougan and Outardes rivers. The combined force of these massive waterways made them a prime target for hydroelectric development. Surveying the Manicougan River around 1920. Despite their potential, 1920s hydro companies deemed these rivers too remote. 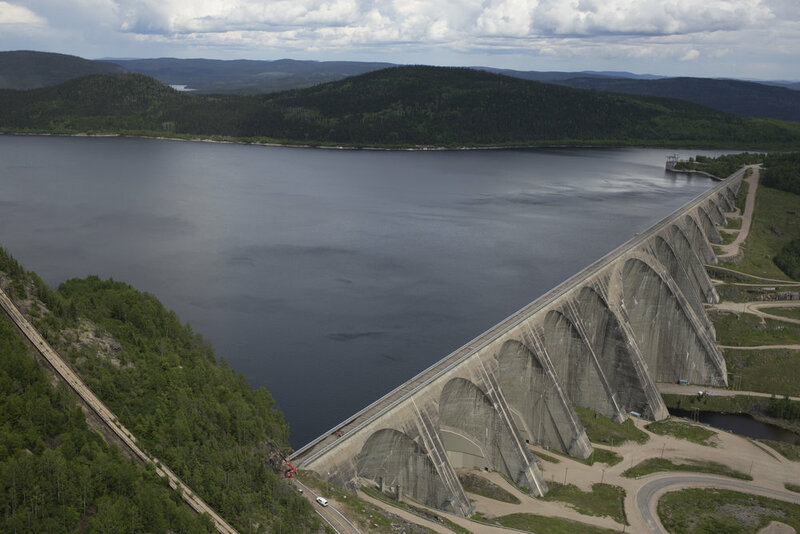 The ideal spots for dams were located in a dense wilderness hundreds of kilometers from the nearest road, and transmission technologies of the time couldn't get the energy to cities economically. The Manicouagan and Outardes were considered unusable for the time being. Decades later, after mining and forestry had trail-blazed access to formerly isolated parts of Quebec's North Shore, the province's newly nationalized hydroelectric utility took a second look at the two rivers. The numbers were so promising that the company didn't wait for their five-year assessment to wrap. In 1959, they began road construction and planned for five dams on the Manicouagan and three on the Outardes. They would finally put these rivers to use. 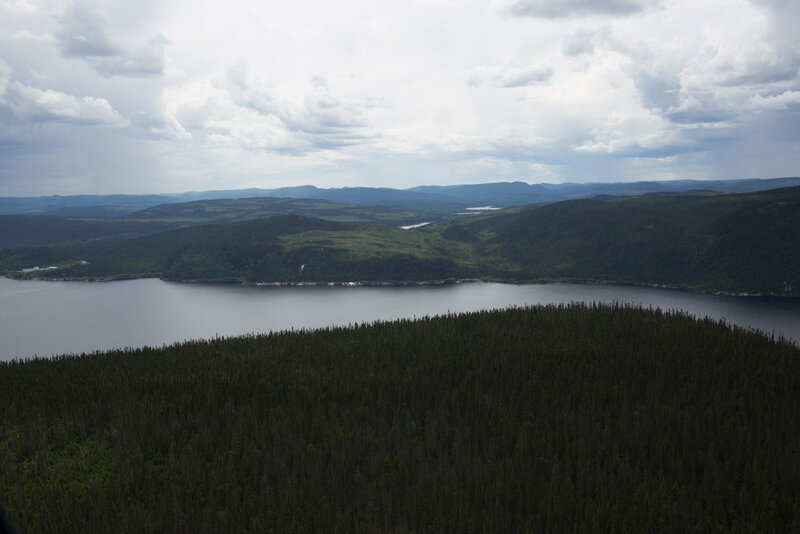 Rivers that had been used by the region's indigenous population, the Pessamit Innu, for thousands of years. The Manicouagan and Betsiamites Rivers on Pessamit traditional territory. When Hydro-Quebec began construction on the dams of the Manic-Outardes project, they did so without the consultation or permission of the Pessamit. Their traditional territory — the land and water they roamed across before and during the colonial period — spans more than 53,000 square miles. Their reservation — the land set aside for them by the government — is less than 100 square miles. The Pessamit were not confined by the borders of their reservation. And, unlike indigenous people in much of Western Canada, they never signed away their land rights in treaties with European settlers. They continued to hunt, fish and trap across their traditional land, paddling hundreds of miles every year to reach their trap lines — winter parcels that had been handed down through the generations. As the dams went in along the Manicouagan, the familiar highway that the Pessamit had used since time immemorial was inundated. The river became alien. The trip north became impossible. As the Manic-Outardes project wrapped in the early seventies, Hydro-Quebec needed to build a power line through the band's small reservation. And so they asked the Canadian government to negotiate. Through Indian Affairs, the Pessamit demanded two million dollars, or free electricity forever. Hydro-Quebec was offering around $20,000. In the end, they the negotiation settled on a one-time lump-sum payout of $150,000, which worked out to $116 per individual. In the language of the agreement, Hydro-Quebec stipulates that this money is to cover all damages — past, present and future — from the development of their rivers. That included the loss of camps, of hunting and fishing grounds, and of the right to hunt or fish up river of the dams. In the time since, Hydro-Quebec has opened the project's jewel, the colossal Daniel-Johnson dam, to tourists. The Daniel Johnson Dam, also known as the Manic-5, is the largest arch and buttress dam in the world. 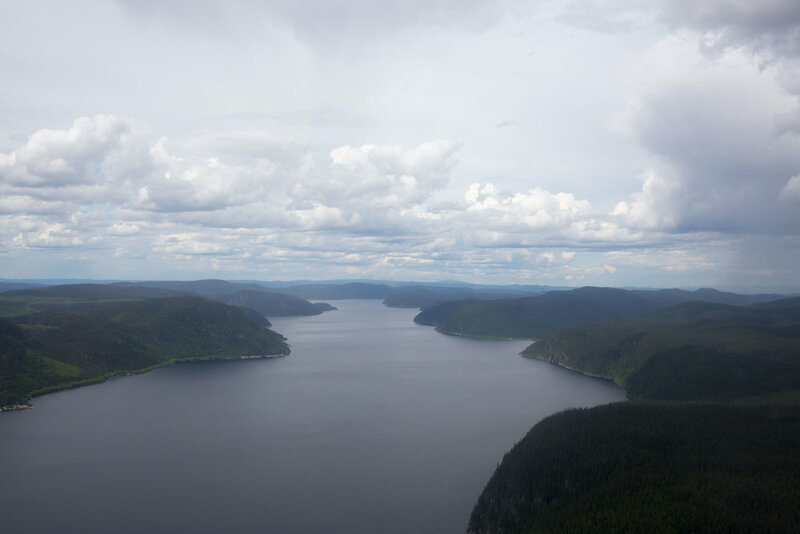 When the time came for Hydro-Quebec's second major project, they set their sights on a watershed that stretches over a tenth of the province: the La Grande River. This river, like the Manicouagan and the Outardes, was at the center of a way of life for indigenous peoples. Both the Crees and Inuit First Nations maintained a semi-nomadic lifestyle along La Grande. Hydro-Quebec approached this project the same way as they had their first, getting to work on a massive landscape-altering plan without notifying the people who lived there. Cree men and women prepare for journey in the 1960s. Credit: Reverend Don Ruggles, courtesy Chisasibi Heritage & Cultural Centre. The chief in Chisasibi, a large Cree community at the mouth of La Grande, caught wind of Hydro-Quebec's project and got the word out to the community. The Crees teamed with the Inuit, hiring lawyers to ask the courts to put a stop to the project. Click and drag to explore the communities along the La Grande. Chisasibi is the largest Cree community on the river, with over 4,000 residents. All the while, construction on the La Grande proceeded. The Crees won their injunction and the work sites emptied out for a week, but the court of appeals quickly overturned the decision. But this time, Hydro-Quebec was ordered to negotiate. They could keep building, but they had to work something out with the indigenous community. What resulted was the James Bay and Northern Quebec Agreement: more than 400 pages worth of land categorization, provisions for local government, education, police and social services, as well as hunting, fishing and trapping regulations. It laid out what Hydro-Quebec would provide to the Crees and the Inuit, and what these First Nations would retain as their own. It guaranteed a voice in any future development within their traditional territory. The agreement also came with compensation to the tune of $135 million. Nine hundred times more than what the Pessamit received just two years earlier. This agreement was historic. It was proof that First Nations had a say in how their territory was used and how their people would enter modernity. It also gave the Crees a sense that there were victories that they could win against Hydro-Quebec... a lesson they would not forget. Outside/In was produced this week by Sam Evans-Brown with help from: Hannah McCarthy, Taylor Quimby, Jimmy Gutierrez, Maureen McMurray, Nick Capodice and Ben Henry. Special thanks to Daniel Barrick.